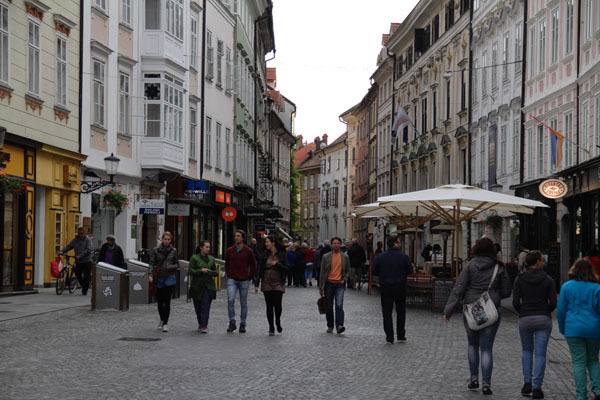 Ljubljana, the small capital of Slovenia, a city located in a privileged enclave, surrounded by Austria, Hungary, Croatia and Italy, emerges like a lung of the big green grass that bathes the territory. You will be surprised by the small number of pedestrians when walking on its cobbled streets. 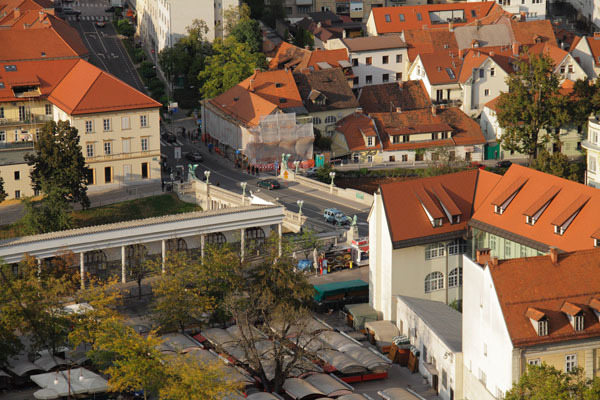 Ljubljana has about two hundred and seventy thousand inhabitants, a very low number for a capital city. It is possible that one of the strong points of the city -its strategic location as a meeting place between a large number of countries, as useful in the past as today- might also be one of the problems the city has, as it feels like a “walking city”. The first thing you feel when arriving to this capital city is not a warm welcome, but a feeling of loneliness and tranquillity that on a lot of occasions you will be thankful for, and that has been an inspiration to many native Ljubljana artists like Francesco Robba and Ivana Kobilca. One of the first things that counteract the partly negative comment from above is that by keeping its original size, the city has managed to preserve a charm that might have been lost had it not been that way. Said charm might be partly due to its small but important collection of monuments, which are all within walking distance from each other and allow a Chinese box layout, every corner giving way to the next. The town council, Saint Nicholas’ Cathedral, the Franciscan Church of Annunciation and Saint Peter’s Church are the main tourist attractions of the city, without forgetting the Dragon Bridge and the Castle, which crowns the steep mountain that seems to reappear in the middle of the city and gives it a distinctive touch. The privileged location of the castle serves the same purpose today as it did years ago, that of a viewpoint, which allows you to be the giant within a small-scale frame. The city, from the castle’s towers, every street and every corner, seem naked and offer a wonderful view in which the Alps of Kamnik occupy a leading position. The heart of the city, the Preseren Square, where the biggest record of activity and tourism is observed, can be easily located as if it were an aerial shot. Watched over by the Franciscan church with shades of pastel that give an original touch to the place, it seems to deserve the status of epicentre around which everything else revolves. It seems to crumble and invite you to go into the city across three bridges (which are merely a small sample of the large number of them) that form a unique structure over the Ljubljanica River. 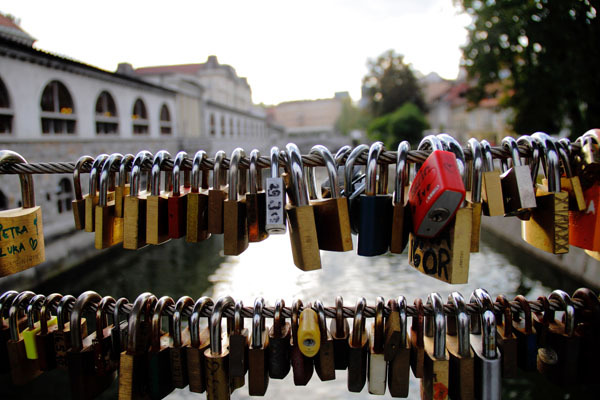 Every bridge, like the Dragon Bridge and its legend about Saint George or the one about the sweethearts and their padlocks, has its own story and brings a particular interest to the city. Finally, it is worth highlighting the Villette asylum, a place you must visit if you are a fan of Paulo Coelho’s books. The complex symbolizes the scene of one of his main works “Veronika Decides to Die”, where the main character, a girl who seems to have it all in life, decides to kill herself because she considers her life monotonous. Her attempt unsuccessful, she is admitted to Villette where she learns that she has only one week to live. The novel, which makes you wonder and reflect about lost time on every page, appears to be based on Coelho’s experience in a psychiatric hospital, showing autobiographical strokes. So if you are searching for the peace of this city’s streets, the inspiration of its flea markets, the mystery and the symbolism that the setting holds and, if you are brave, the suspense of Villette, it is worth falling for this capital that, although small, retains an enormous charm and a story feel. So cross the bridge and enter its history!